Today we are delighted to announce babblevoice desktop – a utility designed to make it even easier to use the phone you already have! Whereas most commentators view a Voice over IP phone system as simply cheaper calls it can truly be so much more. To our mind VoIP is about business efficiency and effective business communications. For example, a common question is how many lines can I have? As those familiar with babblevoice know this question is no longer relevant as there is no real limit. Linking babblevoice to your email, web browsing and customer data also generate tremendous efficiency and prove highly effective. The current iteration of babblevoice desktop is a Chrome extension which means it works when you’re using Google’s Chrome web browser. To see how you can get babblevoice desktop for free please read these installation instructions. You will end up with the babblevoice logo in the top right hand corner of your browser. Clicking on the logo will show you all the extensions you are interested in and allow you to use many of it’s functions. Having used the Chrome extension for some time now I am constantly delighted at how much easier it makes my life. With a single click I can see if my colleague is available and with a further click I can speak with them. 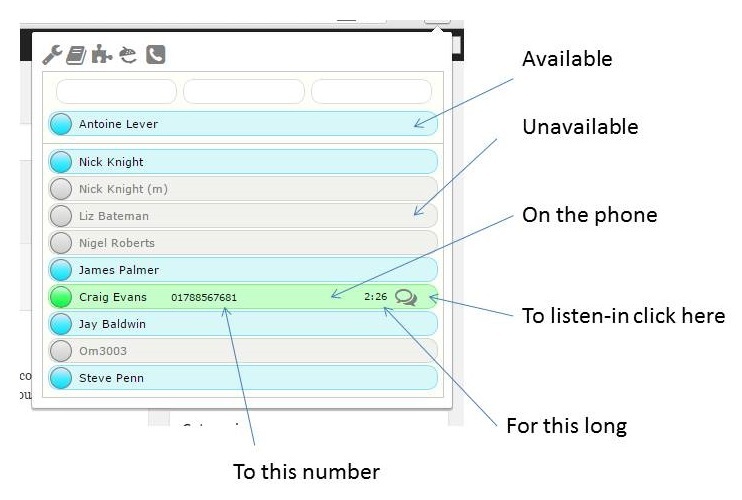 If a call is happening that I am interested in (with the relevant permissions) I can listen-in on that call. I can also connect babblevoice to other applications I use so that the calls I make and receive are far more effective. My favourite feature of babblevoice desktop is being able to click on a phone number to dial it from any webpage. Here is part of a webpage from my favourite Sushi restaurant. Instead of having to dial the number the babblevoice logo appears next to each number (optional) and I simply click on it and I’m connected!